NORTHERN Ireland’s Stormont administration failed to fully achieve almost half the targets it set for itself in the Programme for Government published after the last election. With voters set to go to the polls on May 5, after which Stormont ministers will have only weeks to agree a fresh Programme for Government (PfG) for the new Assembly term, a critical analysis of the outgoing administration has catalogued a series of failings. 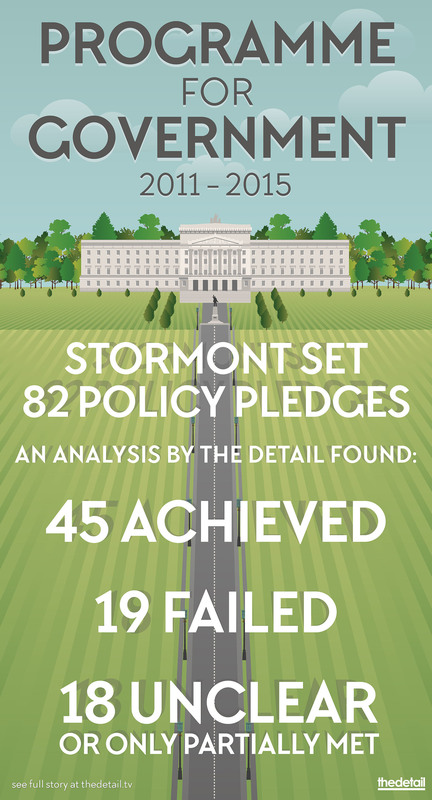 The Detail has found that while 46 of the 82 commitments in the 2011-2015 PfG were achieved, Stormont failed to meet at least 18 measures, while a further 18 were only partially achieved or were found to be unclear. Experts interviewed about the PfG also queried whether some of the targets were set too low and failed to address the level of need in communities. The PfG document identified priority areas covering all government activity over a four-year period, though a decision to extend the last Assembly term by a year gave politicians extra time to fulfil their promises. The blueprint was published in March 2012, 10 months after the last Assembly election in May 2011. The action plan is available on the Executive’s website and progress reports on each pledge are supposed to be uploaded every quarter. When The Detail accessed the site on April 18, officials had marked 64 of the commitments as having been achieved. However, the analysis that measured this tally against the available evidence raised questions over around a third of the 64 government promises. The findings, available in full here, were put to each of the departments, though some failed or declined to respond. Beyond the PfG commitments, a legal action by campaigners last year saw the High Court in Belfast rule that the Executive had failed to meet an obligation to deliver an anti-poverty strategy for Northern Ireland based on objective need. Meanwhile, questions have also been raised over the figures provided by the Executive in its progress reports on the PfG, with a prominent human rights group calling for more transparency. Dessie Donnelly, director of development at the Participation and the Practice of Rights (PPR) organisation, also highlighted the fact some of the targets in the PfG do not go far enough. “The Executive claims to have met the target of building 8,000 social and affordable homes yet this is nowhere near sufficient to address inequalities or meet need,” he said. He said plans for new social housing fell below the required level, while government figures created confusion by including data on new builds with the redevelopment of older stock. “The (PfG) figure of 8,000 needs to be transparently broken down for the public to get an accurate view of whether these new social and affordable homes are targeted at the people and communities experiencing chronic inequality,” he said. There have also been calls for more appropriate PfG commitments and for their progress to be continually monitored in public, such as by an Assembly committee. Economist John Simpson described the current method of assessing the success of the PfG as “incomplete and inadequate”. He added: “The list of 82 commitments does not headline critical comprehensive indicators of progress, for example, on the rate of economic change in terms of real incomes, the rate of public and private infrastructural investment, the delivery of adequate investment in new housing, including social housing, and social progress as might be measured by scale of benefits dependence as proportion of total domestic incomes. None of the key headline indicators are on offer and should be included in the plans for the next period." Actions listed as being carried out by government included increasing visitor numbers to 4.2 million and tourist revenue to £676 million by 2014, eradicating brucellosis in cattle by March 2014, producing a plan to tackle sectarian division, and creating a new 11 council model of local government. The issues found to be ‘partially achieved’ in the analysis included the devolution of Corporation Tax and reducing its level. Although the power to set the rate was devolved, it does not come into effect until April 2017 at the earliest, with its implementation unclear. Most of the PfG commitments had annual ‘milestones’ attached that were designed to illustrate how much progress was being made each year. Some of the commitments that were marked as having been achieved, however, failed to meet these annual targets. Several departments told The Detail that this is because the milestones to chart the delivery of commitments changed during the term of government. Any important new information will be added to The Detail’s review of the PfG.